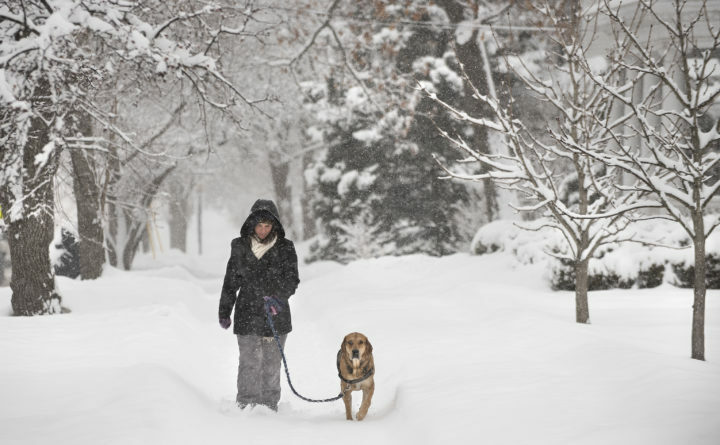 Sara Clark walks with her dog Calvin, a hound mix, in the fresh snow in Bangor Monday morning. "He loves the snow, he is having a great time," she said. A winter storm swept into Maine overnight Sunday bringing as much as 15 inches of snow to parts of eastern Maine. The National Weather Service has placed much of the state under a winter storm watch, with a winter storm warning in effect along the coast. The storm, which rolled into the state early Sunday morning, dumped around 6 inches of fresh snow over Greater Bangor as of 4 p.m. More snow accumulated along the coast, with 12 inches in Bar Harbor, as much as 13 inches in Machias and 9 inches in Eastport, according to the weather service office in Caribou. Northern Maine was spared the brunt of the storm, with only 2-6 inches falling over the crown of Maine. Aroostook County has already seen one of its snowiest winters, and Caribou has received more than 143 inches of snow since October, 84.5 inches more than normal. The brunt of storm missed much of central Maine and the western mountains, where only 4 to 5 inches accumulated. That snow slowed the morning commute for many Mainers, with the speed limit reduced to 45 mph on the Maine Turnpike from the New Hampshire border to Augusta. A handful of crashes were reported on the turnpike Monday morning, including in Scarborough and Sabattus.